Making kids eat beet is a bit like subjecting them to Schubert or Mozart, while their souls swing to the hip-hop beat. In fact, I know most people aren’t nuts about beetroot, and that’s precisely why I tried this salad. I wanted to make beets cool. Most times they are seen on cheffy dishes -watched TV and then forgotten. But there’s a reason why chefs are cooking so much with beets these days. It’s because they’re not just healthy, but can be quite versatile if you make the effort to complement their sweet astringency with the right flavour partners….kinda like finding a soul mate…takes some effort but when you get it right, it’s magic. So having resolved to make a beet salad for dinner, I began shortlisting the cast of ingredients to create some delicious drama. Cooked beets are soft and need a contrasting crunchy foil; I went with a combination of pecans and almonds. Pungent red onion was perfect to play the short, sharp, memorable cameo. Then I needed something strong and robust like a silent, deep, brooding hero worth his salt, to support our sweet, blushing be(e)auty. Enter, blue cheese, bold, and a character that can hold its own. Agreed it’s smelly (like some men!) 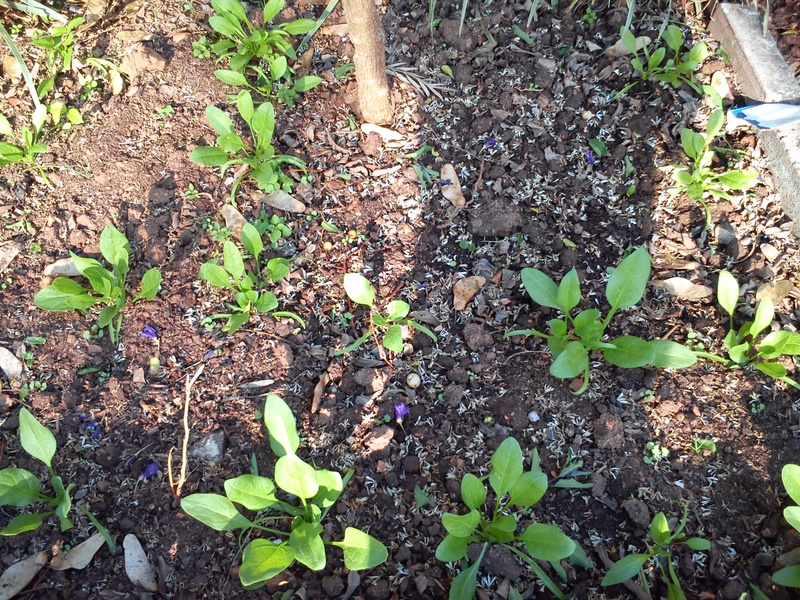 but that’s why it’s perfect in small doses ;-D. Now for a BFF for our beet – fresh baby spinach from my garden (I was so excited to pick my first lot!) added beautiful colour, freshness and a sort of gentle, summery touch. To weave all these ingredients into a single, but layered story, I picked honey and balsamic vinegar. Once I had my cast in place, the rest was easy. I cooked (steamed) the beets and then lightly browned them under the grill with the onions, drizzled with a little honey and balsamic, to create a more resonant flavour and to reduce their sweetness a little bit. Also, this is not a salad that you can toss because then it will resemble red mush. So assemble it on individual plates; that way it looks prettier too. If you like you could roast the beets on their own first, peel and cube them and then grill with the onions and the glaze. For those who turn up their noses t blue cheese, feta is the perfect substitute in terms of its texture and savoury strength. Cook (steam or roast) beets with skins on, then peel and cube them. 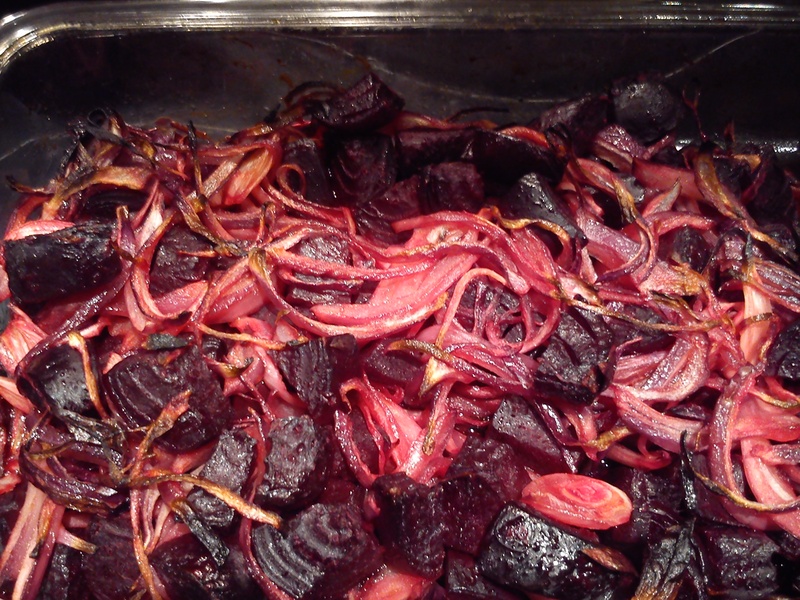 Combine beets and onions in a baking tray, drizzle with olive oil, honey and balsamic. Grill for 15 minutes under hot grill (turning at intervals to avoid burning) till lightly caramelised. Spoon the beets on individual plates, arrange the spinach leaves on top, sprinkle over the nuts and crumbled blue cheese and finally drizzle the jus from the baking dish. Serve with toasted slices of crusty baguette.